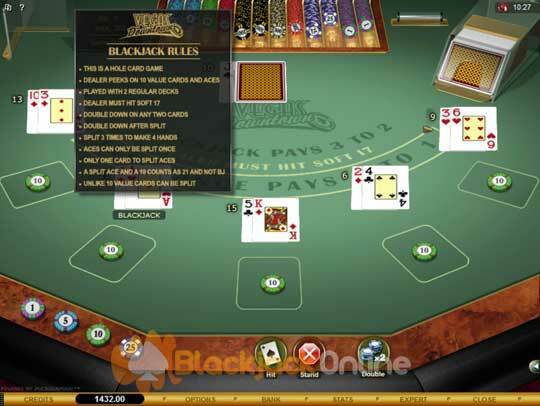 Getting to grips with the playing rules of Microgamings Vegas Downtown Blackjack is fairly straight forward, and the game does boast plenty of player friendly rules. Be aware that when you play it there are a total of two full decks of cards in play, in the shoe. You can play this game for free or for real money at any Microgaming software powered casino site, and when you play it with the best playing strategy the game will return a house edge of some 0.39%. To enable you to play perfect strategy, feel free to download our free of charge Vegas Downtown Blackjack Strategy Card (see below), which will show you instantly how to play any hand you have been dealt. Playing Hard 17+ Valued Hands - The easiest playing tip we can give you in regards to playing Vegas Downtown Blackjack is in regards to all hands dealt to you which are hard 17+ valued hands. Always stand these hands, no matter what card you may be facing in the dealers hand. Splitting a Pair of Threes - An often made strategic playing error players make is to split a pair of three, irrespective of what the dealers up facing card is. You should only ever split a pair of threes when the dealer is showing a 2 to 7 valued hand. If he has any other card showing then hit that particular hand. 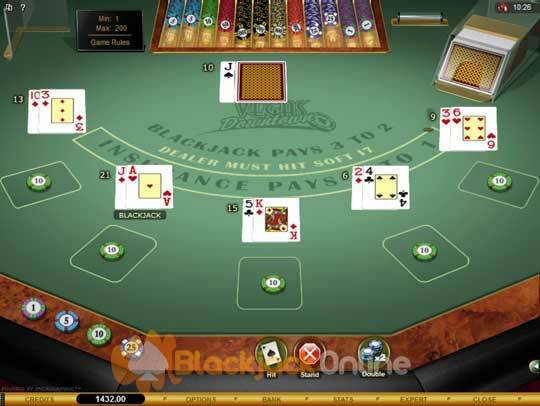 Placing an Insurance Wager - However tempting the 2 to 1 payout odds may appear, the Insurance wager really is a poor valued bet, not only on this Vegas Downtown Blackjack game but on all other variants. So when offered the correct way to play is to decline it. Always hit a Hard 8 - One more easy to remember move to make is in regards to when you have been dealt a hard eight, always hit this hand, as that is the correct strategic move to make and play. Dealer Rules - The dealer will play this Vegas Downtown game as a hole card game, and will always check his downward facing card to see if it is a Blackjack hand when showing either a ten or an Ace. He deals from a 2 card shoe, and the entire shoe of cards is shuffled before a new game commences. The dealer hits his hand should it be valued as a soft 17 hand or any hand which is lower in value. Player Rules - You can double down when playing Vegas Downtown Blackjack on any two cards, plus you may also choose to double down when you have split cards. Splitting any pair including unalike ten valued cards is allowed upto 3 times, but when you split Aces only one card will be dealt to each of them and you cannot re-split such hands. Payouts - Any split Ace and a ten or any non Blackjack hand is paid out at odds of even money. Insurance bets when there are winning wagers pay 2 to 1, and should you have been dealt a Blackjack then your staked amount is paid out at odds of 3 to 2.